List your Why for trying or adding this new exercise. Download and use my January Challenges Worksheet to help you commit to a new exercise. Download and use my 7 day tracking grid to put this week’s goal right in front of you. Keep it front and center on a bulletin board or punch holes in it and keep in a binder. New Video Workout from Beachbody.com or just Google or search YouTube.com the type workout you want. Get Active with Aaptiv – a few workouts are free to members on the Weight Watchers app (WW). This is like having a personal trainer in your headphones or on your screen. Let’s shake up our usual fitness routine by adding at least 1 new exercise, stretch, or movement to our activity. This is a challenge everyone can 100% crush. Share what YOU plan to do in the comments. How will you improve your moves this week? Want notifications of when I post a weekly challenge? Don’t want to miss a challenge post? Find the ***SIGN UP HERE BOX on the upper right sidebar *** sign up with your email and you’ll get a copy sent directly to your email inbox. If you have any feedback or ideas for future posts, feel free to visit my CONTACT & SIGN UP page. 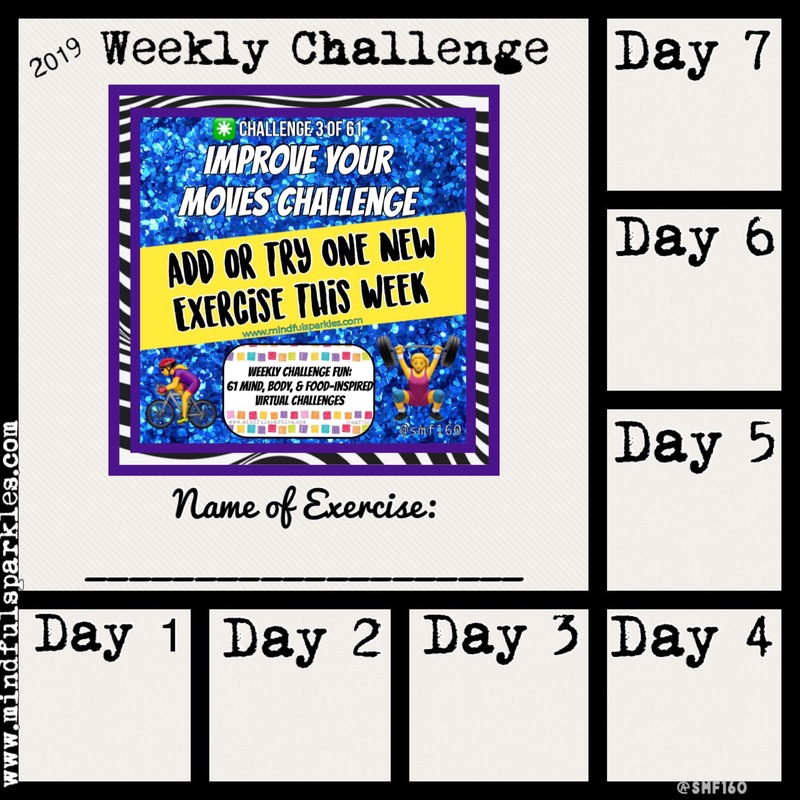 Click here for the original post listing all of the 61 Weekly Challenge for 2019. Here is a calendar of all of the January Challenges.